Florets, lightly fried and served with tahini. Mixed with diced tomatoes, garlic and olive oil. Lightly fried and mixed with cilantro, garlic and fresh lemon juice. Simmered in tomato sauce, diced onions and olive oil. Topped with ground beef, pine nuts and olive oil. (Serves 3-4) A fresh, wholesome dish made from fire roasted eggplant with a hint of smoky flavor, seasoned with tahini, fresh lemon juice and garnished with olive oil. Thick yogurt cheese garnished with olive oil. White rice with vermicelli cooked to perfection. Lebanese style spiced beef sausage, sauteed in lemon butter. Mildly hot homemade beef sausage flavored with garlic and served with spicy tomatoes. Sauteed in garlic and fresh lemon juice. (3 pieces per platter) Boiled cabbage, rolled and stuffed with ground beef and rice, cooked to perfection. Delicately seasoned with garlic and fresh lemon juice, grilled to perfection. House favorite!! Sauteed beef tenderloin with pomegranate sauce and olive oil. Crumbled feta cheese blended with hot paprika, thyme, tomatoes, onions and olive oil. 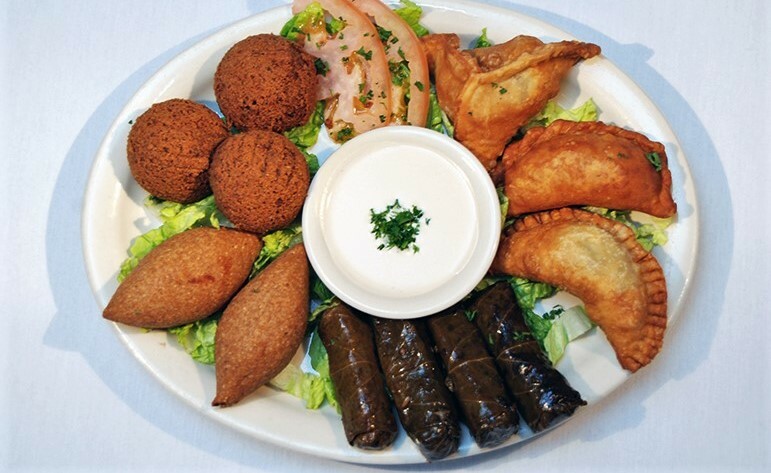 (Serves 4-6 people) Hummus, baba ghannouj, 4 falafels, 6 grape leaves, 3 pies, 4 kibbies, labne and shanglish. Five vegetarian balls of ground garbanzo and fava beans with fresh onions, cilantro, parsley and deep fried. Served with tahini sauce. Oval shaped ground beef stuffed with minced meat, sautted onions, pine nuts and deep fried. 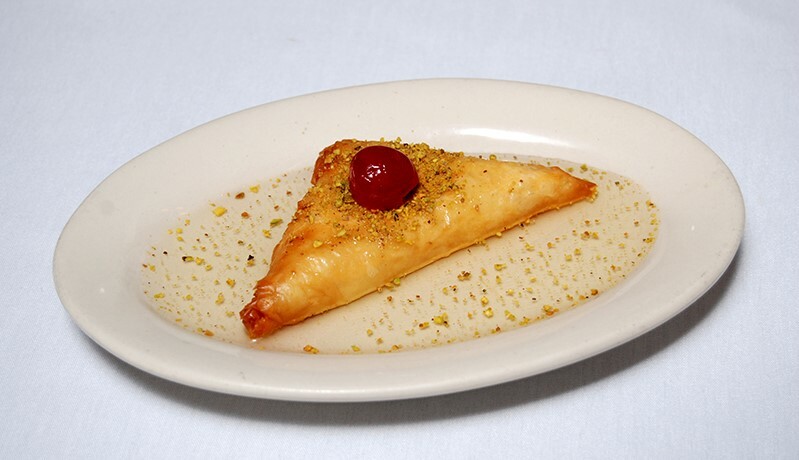 Stuffed with your choice of ground beef, feta cheese or spinach and deep fried. Hand chopped parsley, onions, tomatoes, rice and spice, hand wrapped in tender grape leaves, served chilled. Boiled cabbage rolled and stuffed with ground beef and rice, cooked to perfection. (SERVES 3 TO 4) The famous mashed chickpea mixture with fresh lemon juice, tahini sauce and garnished with olive oil. (SERVES 3 TO 4) Fire roasted eggplant with a hint of smokey flavor, seasoned with fresh garlic, tahini, lemon juice and garnished with olive oil. Fresh raw vegetables: tomatoes, cucumbers, romaine hearts, olives and onions. Simmered grape leaves rolled and stuffed with spiced beef & rice. Freshly cut parsley, diced tomatoes, onions and crushed wheat, flavored with lemon juice and olive oil. Freshly cut romaine lettuce, cucumbers, tomatoes, onions and mint with a mixture of lemon juice and olive oil topped with baked pita bread. Freshly cut romaine, tomatoes, olives, feta cheese with olive oil and balsamic vinegar dressings. Freshly cut romaine lettuce, parmesan cheese and croutons served with Caesar dressing. Yogurt combined with chopped cucumbers and flavored mint. Choice of red or white cabbage with tomatoes, fresh lemon juice, garlic and olive oil. Priced per kabob. Grilled, white boneless chicken meat marinated in garlic and lemon juice with grilled tomatoes and green bell peppers. Priced per kabob. The finest ground beef blended with chopped onions, parsley & spices, broiled and served on rice. Priced per kabob. Tender juicy pieces of beef tenderloin, grilled with tomato and onion. (SERVES 5 TO 8) White rice with vermicelli cooked to perfection. (SERVES 15 TO 20) White rice with vermicelli cooked to perfection. ALL ENTREES COME WITH CHOICE OF ONE SIDE. Tender juicy pieces of beef tenderloin, grilled with tomato and onion slices served with choice of one side. Grilled, white boneless chicken meat marinated in garlic and lemon juice with grilled tomatoes and green bell peppers. The finest ground beef blended with chopped onions, parsley & spices, broiled and served on rice with Choice of side. (SERVES 2) A combination of tenderloin kabob, shish tawook and kafta kabob and choice of one side. Half chicken marinated in lemon juice and garlic and grilled to perfection, served with choice of side. 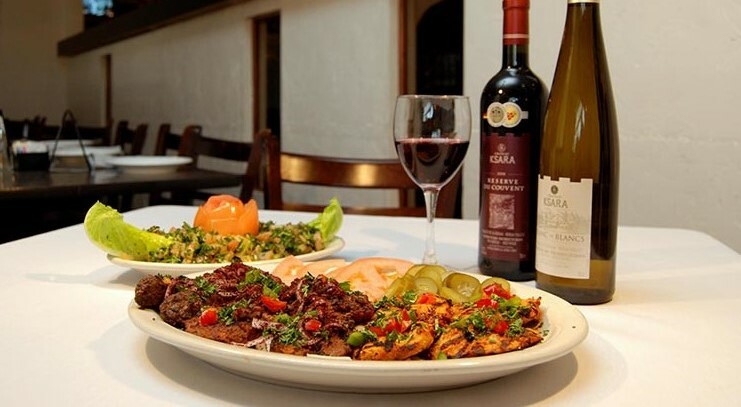 Thinly sliced boneless chicken or beef shawarma served with choice of one side. Thinly sliced boneless chicken and beef shawarma served with choice of one side. Grilled snapper filet, served on a bed of sauteed onions, tomatoes, lemon, cilantro and almonds. 5 Vegetarian friendly deep fried balls of ground garbanzo and fava beans with fresh onions, cilantro and parsley, served with choice of one side and pita bread. Lightly fried and mixed with cilantro garlic and fresh lemon juice. Choice of pistachio, walnut or cashew. Chioce of chocolate or strwaberry. Chioce of mango, strawberry, lemonade, orange and carrot.